Not too bad for an obstructed view! 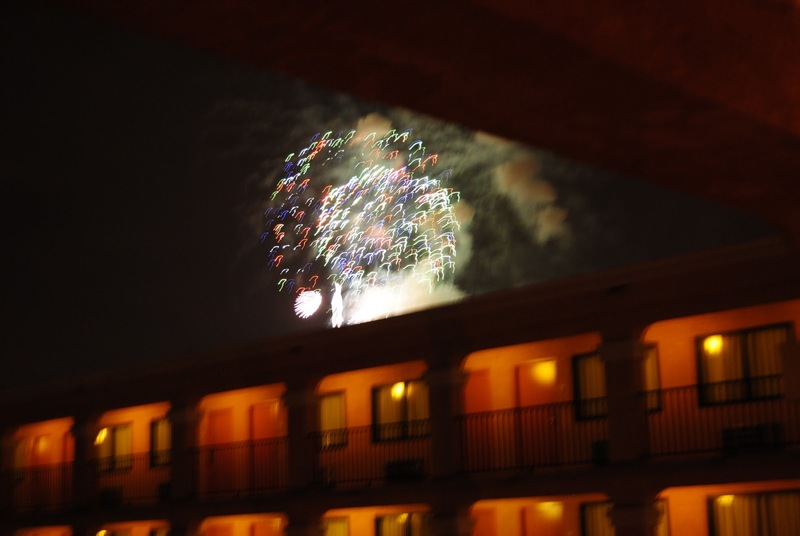 We also had a good view of Disneyland from our hotel room. 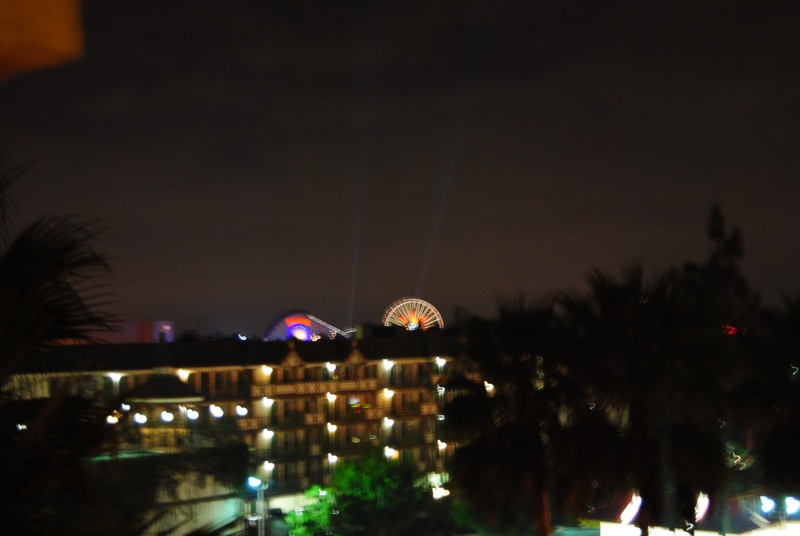 Technically, we had a decent view of Disney California Adventure, but the Monorail track was right across the street. Seeing the Monorail go by built the excitement considerably. ﻿ After watching fireworks, seeing the rides and the Monorail for a few days, we made our way to Disneyland. It was one of the few sunny days we had during our trip which meant the park was very crowded. While a smaller crowd would have been nice, we still had a great time and Monday we got our wish for a smaller crowd which gave us ample time to jump on several rides throughout the day. 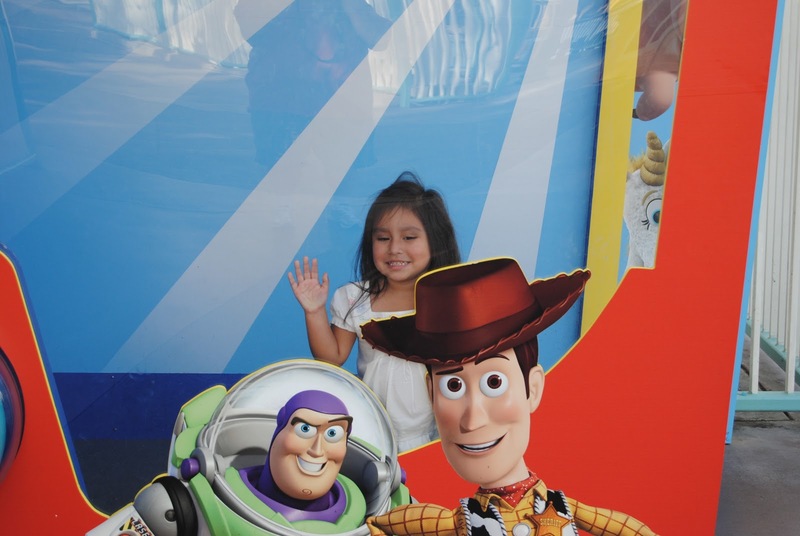 We spent Sunday and Monday visiting both Disneyland and California Adventure. At the time it seemed like two days was enough, but now that we’re home it doesn’t seem like we spent nearly enough time there. Guess we’ll have to go back!!! 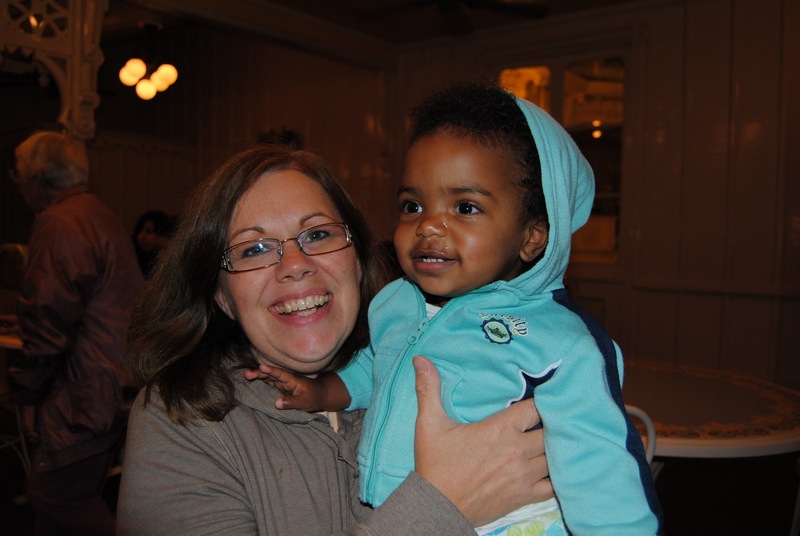 Here are some photos from our Disney adventure. 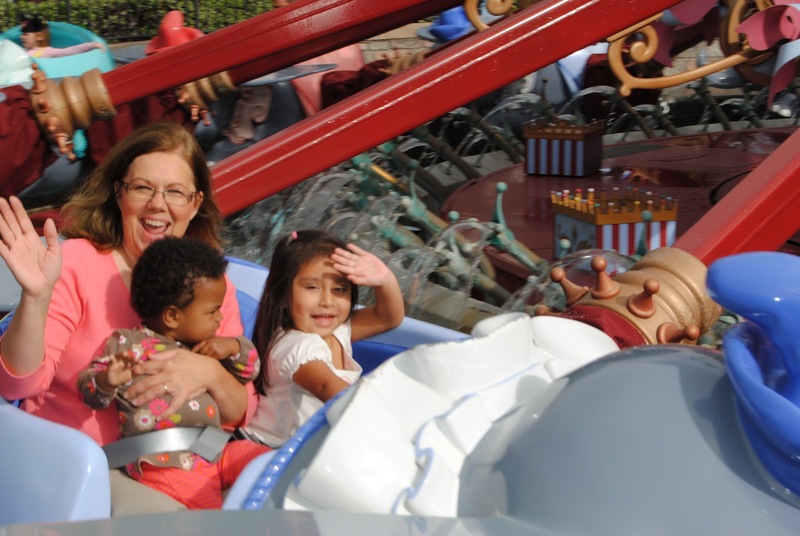 Fun times on the Dumbo ride. 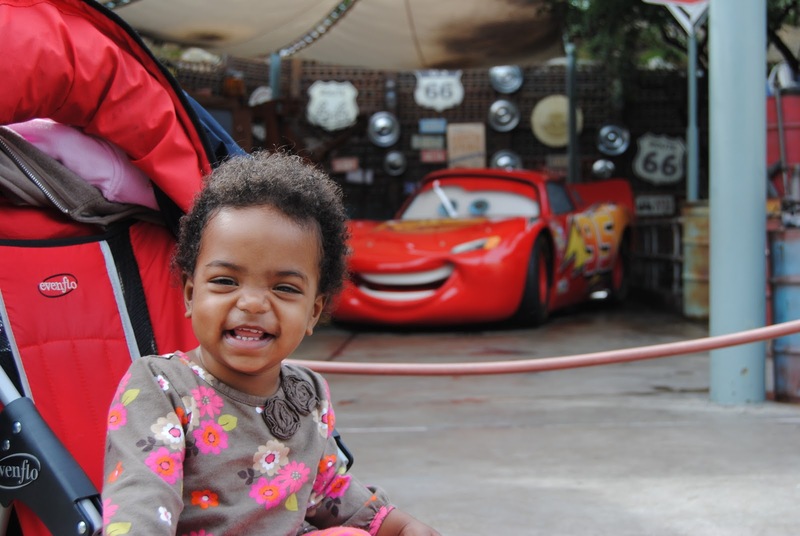 Naomi happy to pose with Cars. California Adventure is in the process of building an entire Cars section at that park. Should be ready in 2012 and looks like it’s going to be a fun attraction. 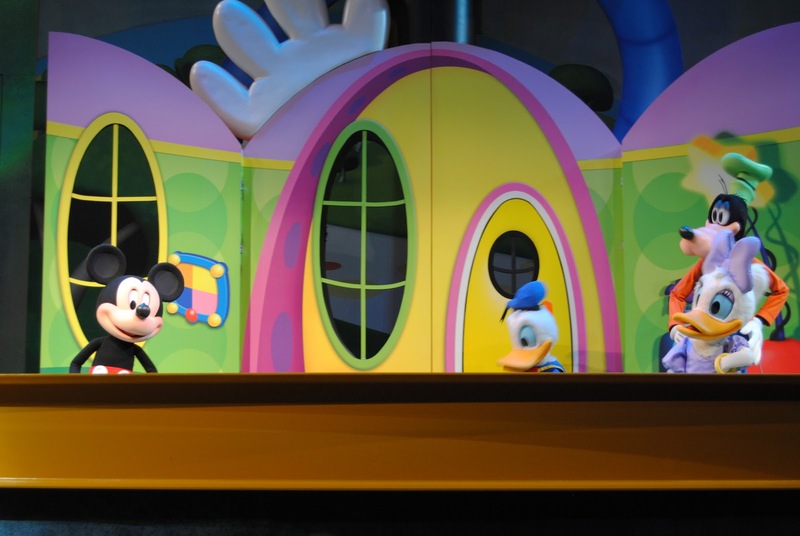 We went to the Mickey Mouse Clubhouse show. Lili and Naomi were thrilled, but Naomi wasn’t happy about being in the audience. 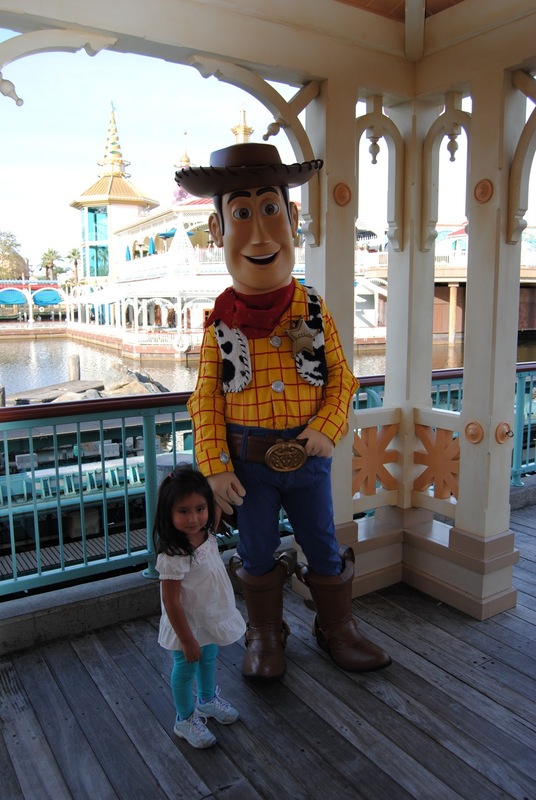 She wanted to be up on stage visiting the characters. What a cute addition to the Toy Story Cast. 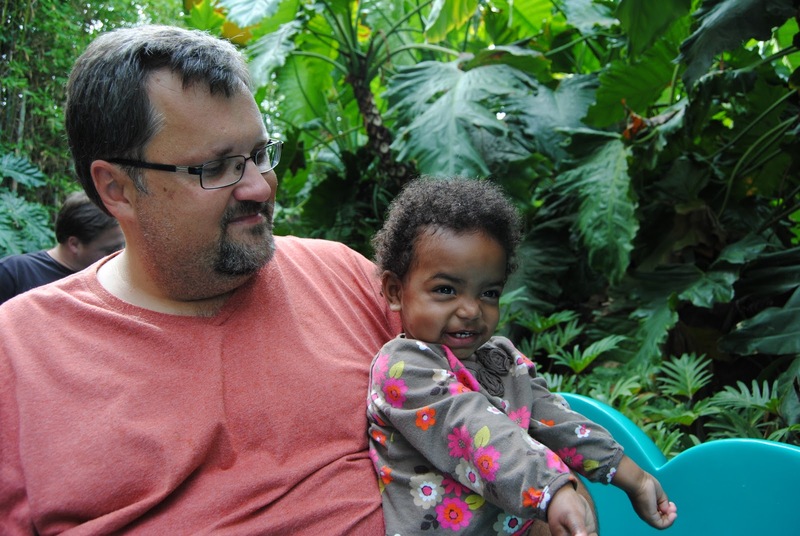 Naomi was loving the rides. 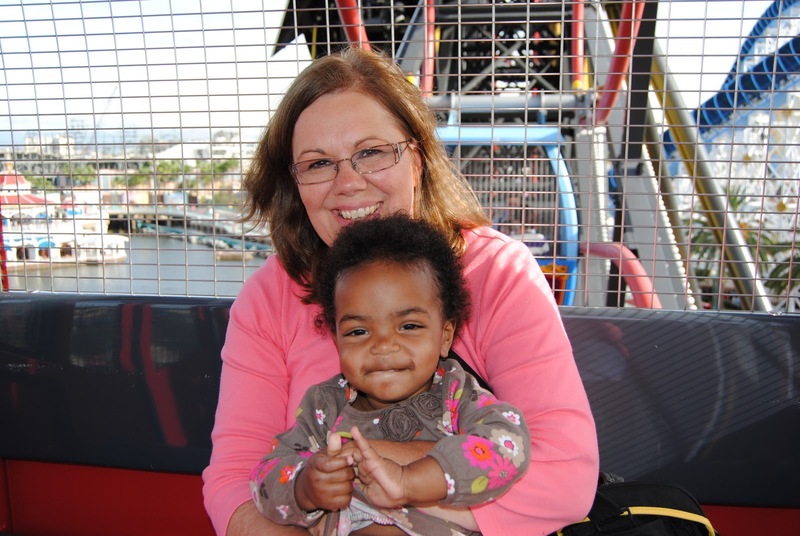 Mommy and Naomi on the Ferris wheel, better known as Mickey’s Fun Wheel. 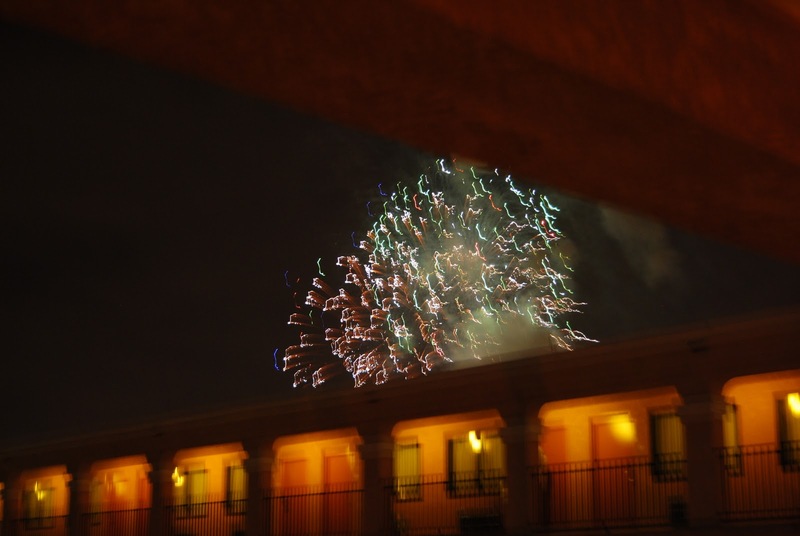 We could clearly see this from our hotel room and Lili talked about going on it for days. Can you tell I was scared? I hate Ferris wheels and this one has stationery cars on the outside of the wheel and cars that slide on a track from the inside to the outside of the Ferris wheel. We were in one of the stationery cars, which was really a good thing for me. 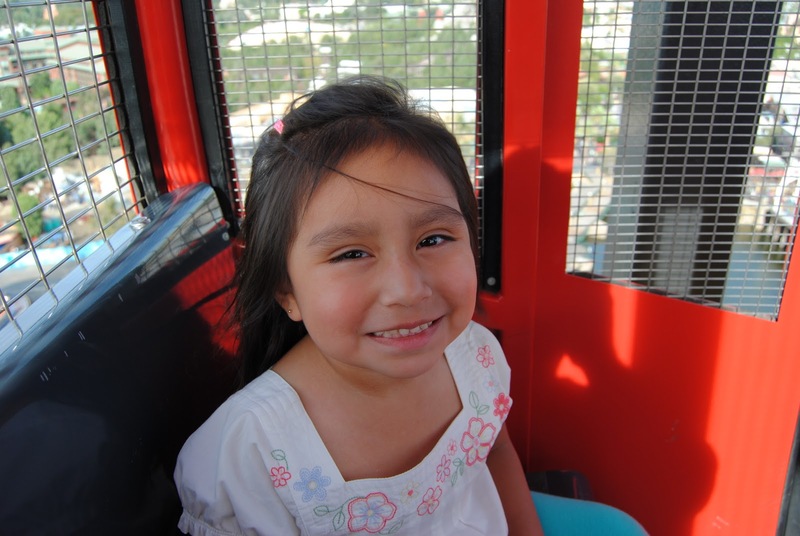 Lili, was not scared on the Mickey’s Fun Wheel. She loved it. 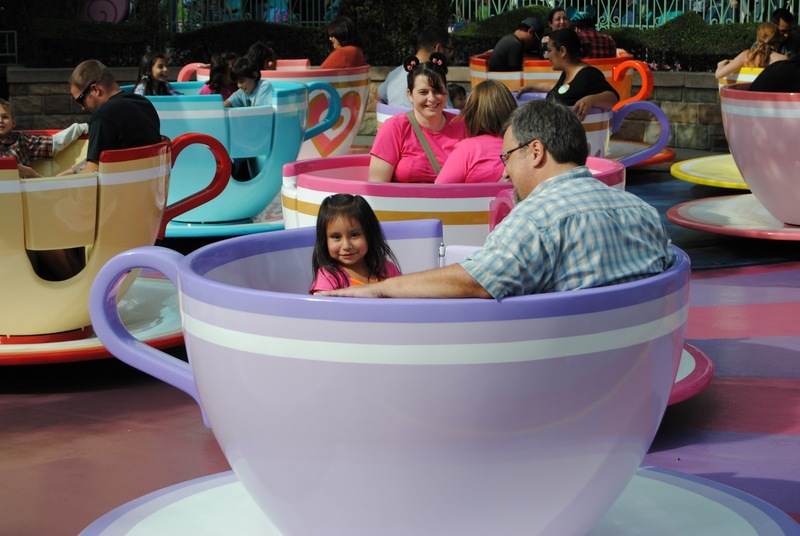 One of 3 tea cup rides for Lili. I believe this was ride #2. 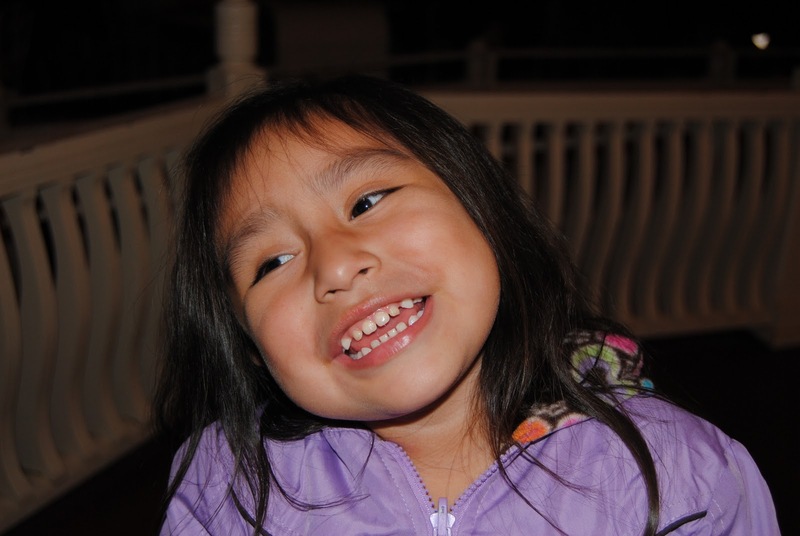 Managed to get a smile out of Naomi for this picture. We were waiting for the fireworks to begin and she wanted to get down and go. If you look closely, you’ll see the tears on her face. Poor baby! We stood in line to see Mickey and shortly after this picture, he had to leave. 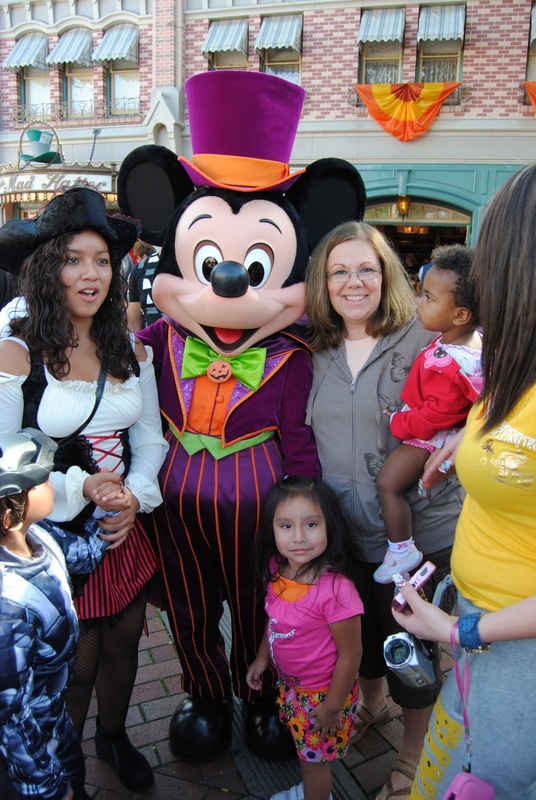 Lili and I were thrilled, but Naomi wasn’t quite sure about the big mouse. He isn’t that big on t.v. 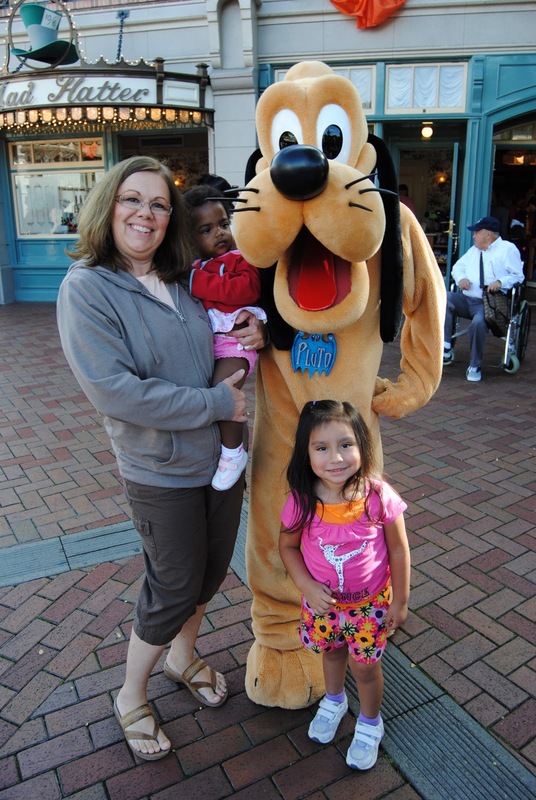 After the picture with Mickey we ran over to get a shot with Pluto. Apparently Naomi was a bit too close for comfort. 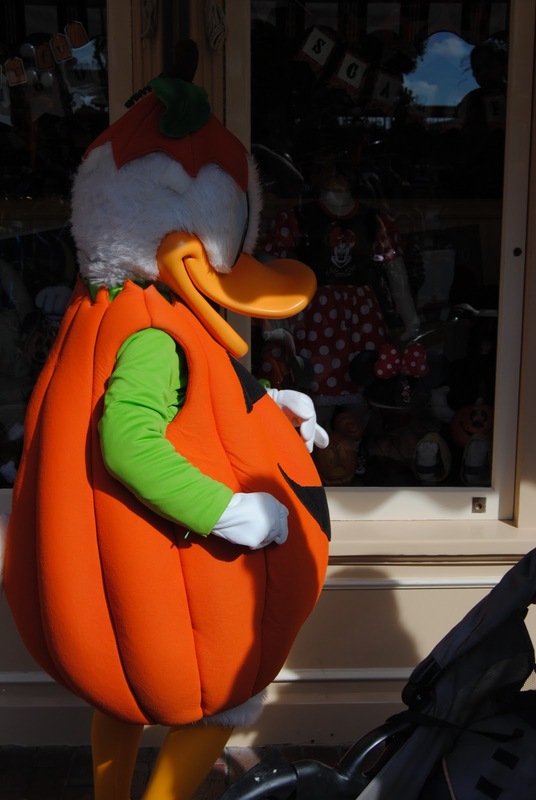 Tried to get over to Donald, but were too late. At least we managed to get a profile shot. Stay tuned for “Celebrate: A Street Party.” I feel it deserves it’s very own post. So much FUN! Glad you had a great vacation!